Adventure Company, Outdoors Ireland, along with other sixty tourism businesses in Kerry, have just become members of the Green Tourism Business Scheme. 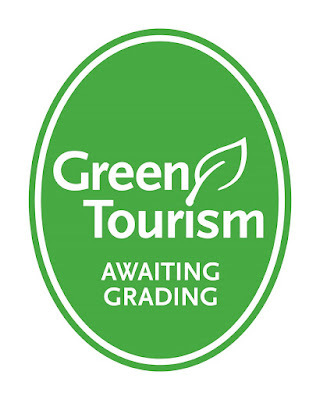 Businesses opting to join Green Tourism are assessed against a rigorous set of criteria, covering a range of areas, like energy and water efficiency, waste management, biodiversity and more. Those businesses that meet the required standard, receive a Bronze, Silver or Gold award based on their level of achievement. The current network of members is comprised of a wide range of business types, including accommodation providers, visitor attractions and corporate offices. Outdoors Ireland are running a competition looking for ‘green’ ideas to implement into their adventure trips. ‘We would love to hear people’s ideas and suggestions as to what we can to become greener and more environmentally friendly’ states Kingerlee. To enter the competition and suggest ideas email info@outdoorsireland.com or click here. We're looking for brave men to take part in our next Singles Adventure Weekend, on Sat 24th & Sun 25th April! Ciaran from Killarney Park Hotel taking shelter from the sun! 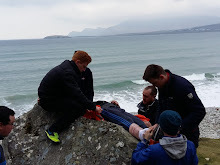 Kerry Adventure Company, Outdoors Ireland, were last week running a series of complimentary adventure trips for the staff of local hotels, guesthouses and hostels in an effort to promote adventure tourism for the coming season. Staff have been out kayaking on the Lakes of Killarney and climbing Carrauntoohil; with more kayaking and rock climbing still to come. So far staff have taken part from the Lake Hotel, Aghadoe Hostel, Rossarney House, Killarney Park Hotel, Aghadoe Heights Hotel and The Moorings, in Portmagee. 'Climbing Carrauntoohil was a brilliant experince. I have never seen Kerry from such an exceptional view.' Oonagh Neilan, from Rossarney House B&B. On Saturday 1st & Sunday 2nd May we're running two days of rock climbing and abseiling on the sandstone cliffs in the Gap of Dunloe. These days are for women only! Learn to rock climb and abseil at your own pace, doing as much or as little as you like, with friendly support, qualified instructors and no pressure! With small groups and all equipment provided, book for a half-day, a full-day or two days of fun, excitement and challenge. There will be a mixture of easy rock climbs for anyone worried about their ability and strength, and harder rock climbs for anyone looking to push themselves. Did you know that proper climbing is actually more about technique, balance and using your legs; rather than strength and pulling yourself up!? Discover the Lakes of Killarney by moonlight, as you use the full moon to kayak along dark wooded shores and among silent islands. Explore the limestone caves from your kayak by torch light. Land on the ancient, mystic ruins of Innisfallen Abbey for fresh coffee, while you savour the breathtaking sight of Ross Castle illuminated by moonlight. Hike to the summit of Torc Mountain as dawn creeps into the fresh sky. Savour sunrise over Killarney National Park, spread out far below. If it's a misty morning enjoy the excitement of swirling cloud, rays of sunlight and the occasional treat of views revealed through a friendly parting in the clouds. Listen to the music of the dawn chorus and local wildlife awakening. Then return to Killarney for a delicious, hearty breakfast at Scotts Hotel. To promote adventure tourism in Killarney and Kerry this spring and summer we are running some complimentary adventure trips specifically for hotel, guesthouse and hostel staff, from Sunday 21st to Wednesday 24th March. We offer year round trips for tourists of all abilities, from beginner upwards, specializing in Kayak Trips on the Lakes of Killarney, Rock Climbing & Abseiling in the Gap of Dunloe and Guided Carrauntoohil Ascents. We provide all equipment for tourists and also offer complimentary transfers in the Killarney area. The following trips are available free of charge to hotel, guesthouse and hostel staff, both to promote adventure tourism for the coming year, and also as a thank you for the customers we were sent over the past year. +353 (0) 86 860 45 63. Liz and John, from Radio Kerry's 'Face Your Fear Of Heights' this morning in the Gap of Dunloe. Just after completing the first part of their challenge; rock climbing and belaying on a 15 metre cliff. Long before Strongbow entered Ireland with his Welsh knights; at the invite of traitorous Irish king Dermot MacMurchada; the Irish were plundering the English and Welsh coastline. Wild and bearded Irish warriors stalked the Irish Sea, landing lightning attacks on unsuspecting settlements and Roman villas. They would loot and plunder what they could, carrying women and children back to Ireland into marriage and slavery. There's stories of highly planned kidnap and ransom missions, with Roman family members being safely reunited with their families once huge ransoms were paid. Like the Vikings with us many years later, for a time the Irish struck fear deep into the hearts of the English and Welsh, and also the Romans, who at the time were encamped in Britain. It was a plundering raiding party, looking for slaves and wives, who carried a Roman boy back to Ireland into a cold life of slavery. This fourteen year old Roman boy, Patrickus, grew into Saint Patrick. This Welsh/Roman man has been adopted by the Irish as one of our patron saints, responsible for converting single handed a land of ruthless pagans into devout Christians, driving snakes from our green and rocky shores and trademarking the shamrock. The story of Saint Patrick is incredible and tough. He's even believed to have killed someone, possibly a lover, during his lifetime. 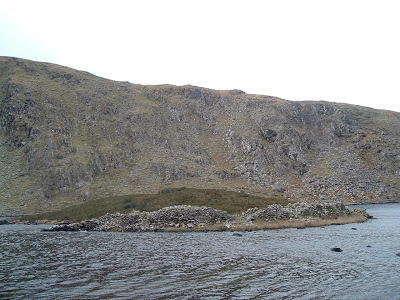 In truth Christian missionaries were traveling Ireland's hills, forests and bogs before a newly ordained Patrickus returned to Ireland, having escaped from slavery in a row-boat several years earlier. Although he wasn't the first missionary to arrive in Ireland; when Patrickus returned as a priest, he had several things in his favour. After six years living here he knew the land, the people, the customs and the language. He was able to move relatively unhindered around the country and possibly because of his Roman noble descent he was treated with some respect. He was also here just at the right time, as the country was ready for the bells of Christianity to toll. The Irish pagans and druids worshipped several gods, including snakes. Certain groups of druids carried a snake tattoo emblazoned on their upper arm. The druids Patrickus wasn't able to convert (and there were many of them) he drove from Ireland; hence the connection with Patrickus driving all snakes from the country. One of our furthermost outreaches is a brutally sharp, protrusion of rock off the Kerry coast, which we now call Skellig Michael. Here stood the final outpost of druids and pagan worshippers; wild, rugged men, who called on many gods, threw curses across the country from atop of their rock and performed human sacrifices - or so Christianity viewed them. For a day or more Patrickus argued and fought with the druids, until at last, weary, bloodied, dehydrated and faltering he drew together his final strength and called upon the archangel Michael to help. What happened next, whether the archangel Michael descended to assist, or whether Patrickus used his final strength, is not known, but he did succeed in driving the last of the Irish pagans off the black rock and out of Ireland and today this rock is known as Skellig Michael - The Rock of Michael. A monastery was built on Skellig Michael, and hardy monks made a life of worship and survival for themselves from the 6th to the 12th century. 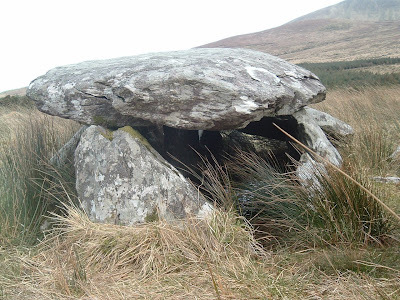 Wherever druids had settled and worshipped, the first Irish priests and monks would often build churches and monasteries in an effort to keep the displaced druids from returning and keep at bay the evil gods and spirits, whom to some extent were still half-believed and feared. This is exactly what happened on Skellig Michael, after being such a powerful pagan site for so long, there was no way Patrickus could leave it to it's own menacing devices. Interestingly, one of the reasons that Skellig Michael was abandoned in the 12th century was because the Roman Catholic Church feared the monks and holy men living in remote locations were becoming too connected with nature, too in awe of the elements around them, and slipping into some of the pagan ways of life; so larger, more central monasteries were built with a more formal way of holy life and worship. The tiny village of Ballinskelligs, near Caherciveen, is where the monks from Skellig Michael were moved; Ballinskelligs meaning Homestead of the Rocks. For a boat trip to Skellig Beag and Skellig Michael I'd highly recommend Seanie Murphy, 066 947 62 14. We at Outdoors Ireland also provide guides for fascinating guided trips to the Skelligs. Fly to Kerry Airport, centrally located in Ireland's spectacular south west, between Killarney and Tralee. Choose from a variety of exciting adventure activities, from relaxing half-day trips to multiple day adventures. Choose your own accommodation to suit your taste, budget and style. Climb through glaciated corries, past deep mountain lakes and along ice-carved ridges to stand on Carrauntoohil's lofty cloud-strewn summit. Paddle the deep, sparkling Lakes of Killarney by kayak or canoe, discovering limestone caves and local legends. Explore ancient trails and savor breathtaking views with an experienced, knowledgeable guide. Experience the fun and adrenaline of climbing and abseiling in the spectacular Gap of Dunloe. Fun and excitement as you master the skills to paddle comfortable kayaks across Lough Leane, wrapped up in warm wetsuits. Exhilarating, exciting, extreme fifty metre abseil on sandstone cliffs in the glaciated Gap of Dunloe! Relaxing boat trip through the Killarney Lakes, followed by biking through spectacular scenery in the Black Valley and Killarney National Park. Work together as a team, or compete against each other, as you tackle adventure challenges, using all your team’s skills. In the heart of Killarney town, near the bus and train station, the friendly atmosphere of the Railway Hostel is ideal for groups to explore all Killarney has to offer. A complimentary continental breakfast is also offered in the mornings. Scotts Hotel is a deluxe Killarney town centre hotel, combining luxury, service and cozy comfort. Live, local bands play in the hotel each weekend. A stay at this family owned 4 star hotel is truly a unique experience. Unwind in luxury spacious rooms, enjoy fine dining, relax in the conservatory or terraced garden, spend some downtime in the leisure club or for pure indulgence pay a visit to the Zen Day Spa. Set on large, private grounds in Killarney town centre, this family owned 5 star hotel offers guests the ultimate in luxury, within comfortable & contemporary surroundings, whilst at all time offering flawless service and ‘Warmth Beyond The Smile’. This afternoon, from 130pm, I'll be on Radio Kerry with Deirdre Walsh of Talkabout. We'll be helping two Kerry people, John Nelligan and Liz Fenton, overcome their fear of heights, through rock climbing and abseiling; eventually building up to a huge fifty metre abseil. Kayaking through one of the limestone islands on Lough Leane. Preparing to tackle the north face of Brennan's Leap. Adventure Company, Outdoors Ireland, are running a Mountain Safety Promotion in the Wicklow Mountains this April, in conjunction with the Great Outdoors Store in Dublin. The fun and intensive days will give hill walkers the opportunity to increase their map reading skills, develop safety awareness, take compass bearings and deal with emergencies, while working in small groups with like-minded people. Hill walking is rapidly becoming a blossoming activity, with increasing numbers of people taking to the Irish hills and mountains, for leisure, relaxation and fitness. While exploring the beautiful and sometimes dangerous mountains, it is becoming more and more important that hikers can use a map, navigate off the hills should mist and cloud descend and know what to do in an emergency. Kingerlee is hoping that the Mountain Safety Promotion, happening on both Sunday 11th and Sunday 18th April will equip participants with extra skills and confidence to enjoy hill walking more fully and even be more adventurous in the future. The day will be divided into morning and afternoon workshops giving participants a variety of choices. All abilities will be catered for, from novice hill walkers to experienced climbers. ‘Everyone over the age of 18 is welcome to attend, with all specialist equipment provided and our qualified instructors will be on hand to answer any questions’ states Kingerlee. ‘The people I’d really like to see taking part are the occasional hill walkers who are dying to venture off the beaten track, but don’t have the confidence or skills to strike off across the hills yet’. Participants are asked to pay what they think their workshop is worth; once they’ve covered the initial workshop cost of €45 per person. Outdoors Ireland have teamed up with the Great Outdoors Store to run a Mountain Safety Promotion in Glendalough, Wicklow. Workshops will cover map reading, compass bearings, navigation techniques, steep ground work, emergency procedures and recognising hypothermia. The promotion will run on Sunday 11th April and Sunday 18th April. The half-day workshops will be exciting and practical, taking place outdoors in Glendalough and the Wicklow Mountains, with small groups of fun, like-minded people. Pay What You Think It's Worth! The minimum price for a half-day (three hour) workshop is €45 per person; but once you've covered this minimum cost you can pay what you think the workshop was worth to you. The Great Outdoors Store, on Chatham Street, Dublin, specialises in adventure equipment and clothing, from mountaineering to skiing to camping. We will also be running the same day on Sunday 25th July. 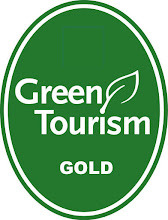 Today we have just become a member of the Green Tourism Business Scheme, following a training course and on-site consultation, which have happened over the past weeks. Becoming a green, environmentally friendly, outdoor adventure company is becoming increasingly important; to preserve the pristine landscape we work in, to satisfy any environmental concerns of our customers and to play our part in demonstrating how it's possible to lessen our impact on the mountains and lakes of Ireland. I'd love to hear your ideas and suggestions as to how we can lessen our impact, improve our environmental ethos and do more to help preserve the stunning and potentially delicate areas we take people hiking, rock climbing and kayaking into. What would you suggest we do or change to become greener and more environmentally friendly? Leave your suggestion or comment below this blog entry, along with your email address. The person with the best suggestion will win an adventure break for two people on 8th & 9th May, involving a day's hiking in the Kerry mountains and a morning's kayak trip across the Lakes of Killarney. This Easter try something different! Either by yourself, as a couple, or as a group of friends pick and choose from adrenaline and excitement or relaxation and breathtaking scenery! Hike through glaciated corries, past deep mountain lakes and along ice-carved ridges to stand on Carrauntoohil's lofty cloud-strewn summit! Explore the deep, sparkling Lakes of Killarney by kayak or canoe! Beginning at 15th century Ross Castle, paddle into Lough Leane, discovering wooded islands, limestone caves and local history. Spend an exciting morning discovering the fun and adrenaline of rock climbing and abseiling in the Gap of Dunloe, just outside Killarney. Climb on warm sandstone cliffs, in the company of a friendly, qualified instructor.